Please note: 2nd seats and car seat adapters are no longer available for this B-Ready and therefore can only be used as a single stroller. The new B-READY stroller from BRITAX is a versatile, modular stroller that can convert from a travel system to a single or in-line double stroller. With 14 different configurations the B-READY stroller is adaptable to fit your needs. Featuring a reversible top seat with a weight capacity of 55 lbs, the B-READY introduces an industry first: a non-rethread, adjustable, 5-point harness system. An extra large canopy, 3-position recline, adjustable leg rest, and full suspension will ensure the travelling comfort of little ones. As an in-line tandem stroller, the second seat is certainly not an afterthought. With 4 recline positions, the second seat is appropriate from birth to 35 lbs. Perhaps most impressive is the fact that the second seat does not need to be removed to fold the stroller. A single step locks and unlocks both rear wheels. Caregivers will further appreciate the adjustable handle height and over-sized storage basket that is accessible from all four sides. A drink holder, and CHAPERONE CLICK & GO infant car seat adapters are included. CLICK & GO integrated adapter system works with BRITAX CHAPERONE and B-SAFE infant car seats and bassinet. I love this stroller! This is the second time I�€™m purchasing it for my second child. It�€™s been awhile but I wanted my second baby to have a nice new stroller and I love how sturdy and big this stroller is. I would go shopping and almost the whole cart fits under the stroller. It�€™s not flimsy and very well built. I definitely recommend it especially now when it�€™s super cheap. I love this stroller! I walk my son to school each morning so I needed something that was easy to maneuver and that would grow with my 2 month old and this fits all the qualifications. I love that the seat can be flipped around and that the handle bar height is adjustable. My little guy looks comfortable and the ride is so smooth he sleeps like a dream. Albee store is the best . Fast shipping and exceptional prices . Is my second time buying first l bought it 6 years ago for about $450 but my 9 years old is almos 65 pounds he seat in one corner of the seat and boom he braked but for a 6 years old stroller l think was time to have a new plus the price was awesome l got the second one in black Friday for only$ 159 dollars It's super good deal and l really love this brand because l have 3 children 9,6,4 and yes they sleep when we go to Disneyland, lego land or L.A or even mall . ,and they deliver it very quick . My all time favorite stroller! We got this stroller back in 2013 when our daughter was born! Kept it til she was about 4 and gave it away to another lil baby! We miss it everyday. We have been through about 3 other strollers since then, and we always compare it to this one. It was so comfortable and functional for both mama and baby! Now with our baby boy, we want another oneeeeee! Its so durable outside and so easy to push. My girl slept many hours in this stroller and made naptime outside the house a breeze! This stroller rolls much better and turns much better than our B-Agile we had. The only complaint we have for this one is it would be nice to have a pouch/pocket for storage near the handle to store things like keys, cell phone, etc. Im in love with this stroller. Unfortunately this was my third stroller after a useless graco jogger and a hard to maneuver Eddie bauer I sprung for britax. My husband and I would have been able to do so much more with our daughter with this system. My daughter loves this stroller it's so easy to push and comfortable for her. I've never been more impressed with a stroller before now. We had the chance to tour Britax headquarters in May 2018 and ever since, we've been a britax family. I knew once we were expecting, we'd be going with a double stroller from britax! This stroller was so easy to put together and our 14 month old loves it! It's not too heavy and it's more compact than most double strollers on the market. We love that the second seat can be removed and we can put on the infant seat adapter until our newest addition is big enough for the second seat! The parking break is one of my favorite features. Most strollers you have to mess with forcefully pushing up or down on the brake to lock the stroller. With the B ready G3 it's so easy, just press and release the brake to lock or unlock. 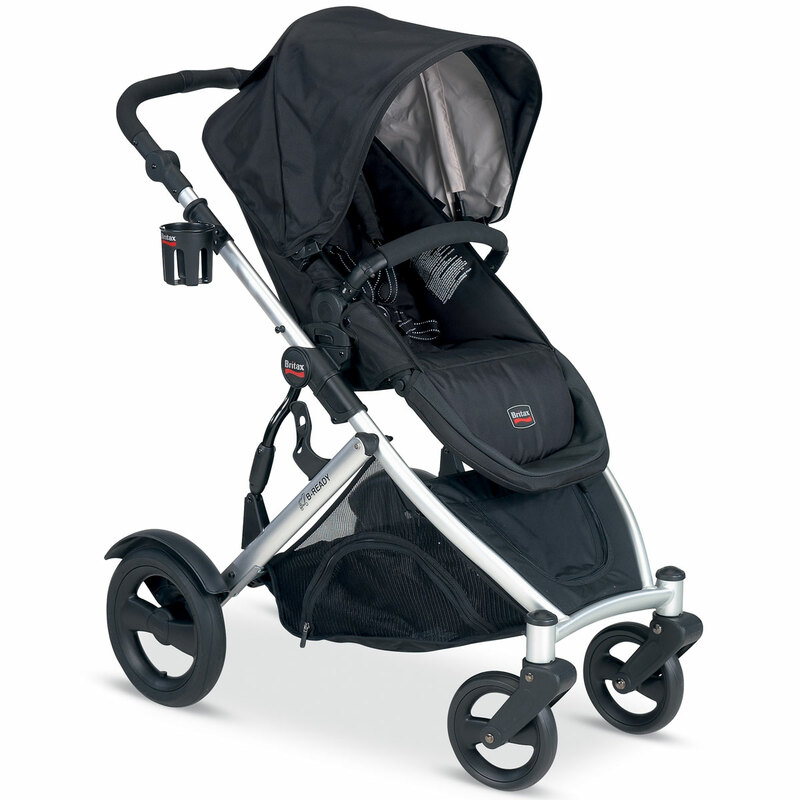 Another thing we love about the stroller is the ride, it rides so smooth and is so easy to push and maneuver around. We can't wait to be able to easily take our girls out and about with our B-Ready G3! I was just about to buy this stroller for $300 from Walmart until I found this website and I am so happy I didn�€™t, I saved $130!! I love this stroller and this website! This stroller is the best!!! My husband and I absolutely love this stroller!! We have been through a lot of strollers but this one hands-down is the best stroller out there. It�€™s easy to use and very practical. It�€™s easy to open and close. I love the big storage basket. My two-year-old loves the stroller and he�€™s very comfortable. I would highly recommend the stroller to anyone!! Also the price is absolutely amazing.. The stroller is worth every penny! Best Uses Every day stroller!!! Love this stroller and even more loved the price! My baby looks so comfy and falls asleep easily in this stroller! It�€™s a bit bulky but great for a long trips, I purchased this for when we go to amusement parks to ensure my baby is comfortable and the storage is wonderful! I would definitely recommend this stroller for families on the go and need the extra space. My husband can be quite picky and he himself is completely satisfied with this stroller! It rides smoothly and is completely ideal when snapping the infant car seat right into the stroller. Shopping trips can't get easier! Works great on all terrains. I bought this model mainly because I live on a gravel road. It works beautifully on the gravel and in the grass. It is very wide and bulky, I wouldn't recommend for shopping in tight spaces. Front wheels sometimes make closing a challenge. Cup holder is extremely flimsy, mainly use for sons sippy cups. My son loves this stroller and will fall asleep in his car seat or the stroller seat no problem. How is it possible that we bought this 2 years ago and Britax has discontinued the adapter that allows you to carry a second seat? Now, we basically need to throw away this stroller and buy a brand new one (model 2017). Things should not be like this, BRITAX! Easy to operate with one hand! I love this stroller! It is very easy to use and operate with one hand. My daughter is only 1 and prefers to walk than ride but I love this stroller. It also stores away pretty easily! Great quality for the price. The stroller has good quality and is very light. It is an excellent option. We are happy with it. The stroller has one point that needs to be improved. When the chair is lifted forward and the stroller bounces, our kid tends to hit his head against the rod of the structure. The stroller has good quality and is very light. It is an excellent option. We are happy with it. The stroller has one point that needs to be improved. When the chair is lifted forward and the stroller bounces, our kid tends to hit his head against the rod of the structure. Love this stroller. It's a great size and a breeze to push. Love it! Great stroller, easy to use and rolls smoothly! Purchased this stroller to use for my infant grandson, love the complete system versatility. My one issue is that there is no option to adjust the handle. Being "vertically challenged", my wrists and arms are not in a comfortable position while pushing and tend to go numb if I don't change positions often. Otherwise, I am very pleased with the stroller and system overall. I got this stroller a couple months ago. I really like it over all but I am having two problems. Problem one I can not figure out how to get it to recline. It is struck in the seating up position. Problem two I can not find a child tray for it because it is a retired product. Other then these two problems this stroller is lightweight and get for travel. My child also seems every comfortable in it. I have been very pleased !Great service and fast shipping !I will definitely order fom Albee again. THE BEST STROLLER AS A DOUBLE! This is the first stroller I've purchased to use as a double & I couldn't be any happier. Definitely worth the price! I love that it can be used as a single stroller as well. Unlike other doubles where you don't have that option. I'd recommend this stroller over & over again to a friend or family! I would even purchase this stroller again! Overall I love the design of the stroller. I only with the handle was a little taller. Also I wish they would include at least a cupholder. I'm not crazy about my toddler not having anything to but her cup in.I love that the wheel is easily removable I have a honda accord and I have limited space in my trunk and being able to remove the wheel it fits perfectly. Overall I love the design of the stroller. I only with the handle was a little taller. Also I wish they would include at least a cupholder. Im not crazy about my toddler not having anything to but her cup in.I love that the wheel is easily removable I have a honda accord and I have limited space in my trunk and being able to remove the wheel it fits perfectly. Improving back words by removing footrest in 2016 model. I'mproving back words by removing footrest in 2016 model. We upgraded from the britax travel system stroller when we were expecting our second child. I liked the option to add another seat and this drives way better than the britax b agile. It is if course much more expensive and heavier. Great for versatility since you can remove the seat and attach the car seat without keeping the seat on. Of course added but expensive options are the ability to add the second seat or use the bassinet. We have the second seat but can't really justify spending the extra $ on the bassinet at this time. Would recommend as an everyday stroller but definitely not a travel stroller. This stroller is amazing! It's easy to use and it opens and closes efficiently, which is really important to me in a stroller. I love the brake feature, which is easy to put on no matter what kind of shoes I'm wearing, and the storage basket underneath is large enough for me to use to go grocery shopping! I love that I can unzip the front of the storage underneath for easier access and to make more room. The stroller moves well indoors and outdoors, and my daughter has enjoyed sitting in it. I recently purchased my second B-Ready. This is the best stroller I've ever owned! The stroller is absolutely incredible, whether you use it as a single or a double. I had the B-Agile as part of my travel system and loved it; when I had my second child, I tried out a side-by-side double stroller from another company and absolutely hated it. It took up a huge amount of space in the car, it was difficult to push and cumbersome to fold and unfold. This one pushes so smoothly that my three-year-old loves to push his little brother around, and the adjustable handle height makes it easy for him to do so. Folding and collapsing is a total breeze. It's great that it has the footprint of a single stroller, but can convert to double stroller capabilities. I love all the different configuration options! We got the additional second seat and my six-month-old happily napped it while we were at Disney World, which was nothing short of a miraculous feat. It's extremely easy to clean too! Countless parents still have stopped us and remarked on what a smart design this is and how they've never seen anything like it. I love how much storage it has underneath and the fact that the basket has zippers on the front and both sides for you to easily access what's in the basket, regardless of whether you have the second seat attached or how low you have the foot rest on the upper seat. It's just such a smart design �¢â¬" well done Britax! Unbelievable customer service as well. The stroller is absolutely incredible, whether you use it as a single or a double. 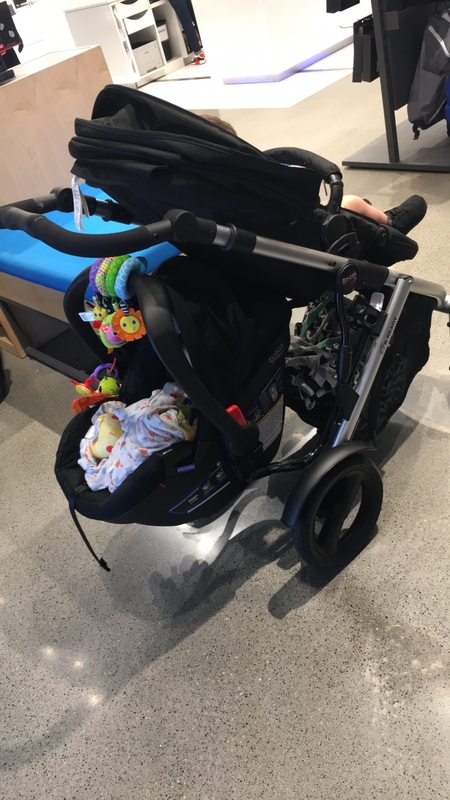 I had the B-Agile as part of my travel system and loved it; when I had my second child, I tried out a side-by-side double stroller from another company and absolutely hated it. It took up a huge amount of space in the car, it was difficult to push and cumbersome to fold and unfold. This one pushes so smoothly that my three-year-old loves to push his little brother around, and the adjustable handle height makes it easy for him to do so. Folding and collapsing is a total breeze. It's great that it has the footprint of a single stroller, but can convert to double stroller capabilities. I love all the different configuration options! We got the additional second seat and my six-month-old happily napped it while we were at Disney World, which was nothing short of a miraculous feat. It's extremely easy to clean too! Countless parents still have stopped us and remarked on what a smart design this is and how they've never seen anything like it. I love how much storage it has underneath and the fact that the basket has zippers on the front and both sides for you to easily access what's in the basket, regardless of whether you have the second seat attached or how low you have the foot rest on the upper seat. It's just such a smart design " well done Britax! Unbelievable customer service as well. We got the B-Ready when my youngest was almost 2 but worried about how much she'd use it (since she typically fights strollers in busy environments). Pleasantly surprised though, my daughter LOVES it. The seat is perched high enough to feel like she's in the midst of the action and it's comfortable. Bonus for me, it's got a bunch of under-seat storage and as a mom of 3, that's very necessary. PERFECT stroller for our growing family! This stroller is amazing! I have a 2 1/2 year old and 1 year old, and it is perfect for them both. We have two seats, and both kids love this stroller, and fall asleep in it even! Assembly is super easy, and taking it in and out of the car isn't too difficult either. The storage space underneath is HUGE compared to to other strollers, and I love how smooth it rides (even over grass or dirt). Make sure you get the cup holder accessory for the handles and for child tray - it's a lifesaver. We bought the whole system when our daughter was born 4 years ago (B-Ready, B-Safe, Second Seat). It always served me well on trail walks. It was great transitioning my daughter out of the stroller when her brother arrived and mom was still able to get her long walks in with both children. Although it is heavy to lift in and out of the car you would never know when you are pushing it. Folding and unfolding it is very easy. I received this stroller at the start of summer and have used it everywhere (soccer field, walks around the block, grocery store, mall, etc.). The canopy is extra large and changing positions of the seat and car seat adapters make all functions a breeze. The single hand push/maneuverability is great with a toddler or fussy baby. Undercarriage basket is great when making a quick trip to the grocery store. Very compact and takes up little trunk space. Not good on crushed gravel and wished it had straps for carrying it on your back. There should be a "Very Good" rating. Awesome stroller, great features and looks. This stroller is great for everyday use! With three boys under 6, this has been a bed, a safe, and a backsaver. I am usually a baby wearing mom but when you travel, this has been a no brainer. I have now purchased two and did so much research to assure that after 5 years, this double stroller stayed at the top of its league! My 6 year old will still get in and my 2 year old loves it. You won't be disappointed in this investment! I just love this stroller. Is really easy to use it and pack it. One great thing about the B-SAFE 35 Elite car seat along with the B-Agile stroller is that the car seat clicks in, directly to the stroller with a click and go system. The stroller is easy to fold and lightweight. We really like it. This stroller looks nice and is great in concept since you can rearrange seats, add a second and adjust the handlebar. However, since day one the frame has been wobbly, the wheels seem cheap and like they might fall off, and the footrest portion of the seat broke off the second time we used it! In addition to that, the stroller is heavy, bulky and super awkward to try to set up and fold - I say that and I'm 6'1", I can't imagine how smaller people maneuver it. DEFINITELY not worth the money! Received this stroller 4 years ago when I was expecting my first child. We bought the entire travel system and couldn't have been more pleased. The infant car seat and base did what it needed to do when she was young. Now at 3.5 years old, we are still happy with this stroller. It's wheels have been thru grass, beach, long hours of walking and I have not had one single issue! Lightweight. Maneuvers with 1 hand. Easy parking brakes. Easy open/close clasps. We love the large cover as it shades her on those brutal Florida summer days. Only 2 small issues...When my daughter is sitting in the stroller, the opening to the basket below is decreased due to her weighing down on it. Sometimes I have to ask her to get out, so I can stuff a small cooler bag in. Also, the handles are a little short. For me, it's perfect, however my husband is 6'1'' and he has to hunch over a little when pushing. Adding extensions to the handle bars would be a great upgrade for the next addition. This stroller was a gift when my husband and I had our second child. We were looking for an easy to maneuver stroller that would be able to fit easily down store aisles. This stroller was very easy to put together and it is very easy to push around. I love the different configurations that you can do with it to accommodate a seat or carseat. It has been very helpful holding our older son in the seat and our newborn with the infant carseat attachment. Amazing stroller and worth every penny. We purchased this product with the infant carrier and the stroller system which all came in one box and it was very easy to put together. You don't even need the instructions, very well designed. After days of research we dicided to go with this one after all the great reviews we read and I am happy we did.. We have not got to test it yet since our baby is still hanging out in his Moms stomach but we are very excited to test this bad boy to its limits.. The original stroller description says that it comes with the car seat adapters and cup holder, is that correct? Because it also says that car seat adapters are no longer available for this model. Thank you in advance. 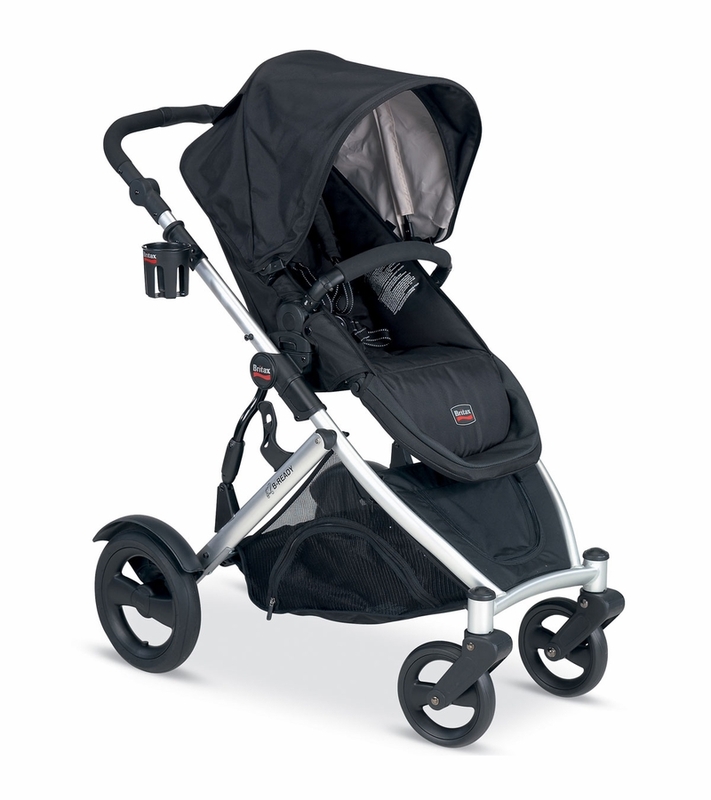 Is the Britax Endeavours car seat compatible with this stroller? Yes, per Britax it is compatible with the stroller. Would the Britax chaperone car seat fit into this stroller? We are looking into purchasing the britax endeavor spark collection infant car seat. Will this strolller work for this infant car seat?